Esther Wertheimer was born in Poland, in 1926, and grew up in Montreal. She began studying art at the Montreal Museum of Fine Arts and then later at the Accademia di Belle Arti di Firenze in Florence, winning many scholarships and grants includinga Borsa di Studio from the Italian Government, a Canada Council Travel Grant and an Elizabeth T. Greenshields Grant. According to an online contribution at Ribbon Dancer, Wertheimer's sculpture exemplifies an interest in "...more poetic gestures and expressive forms. She continues her love of the figure, using graceful elongations to capture the rhythmic beauty of the human spirit. Life and energy flow from extended limbs and cascading draperies. There is a deep-rooted joy forming the essence of each work-the joy of living. With balance and strength, dancers are captured in dynamic weightlessness, their forms generating a language of visual poetry." We think the above an appropriate description of the fine Wertheimer pieces that we are making available. 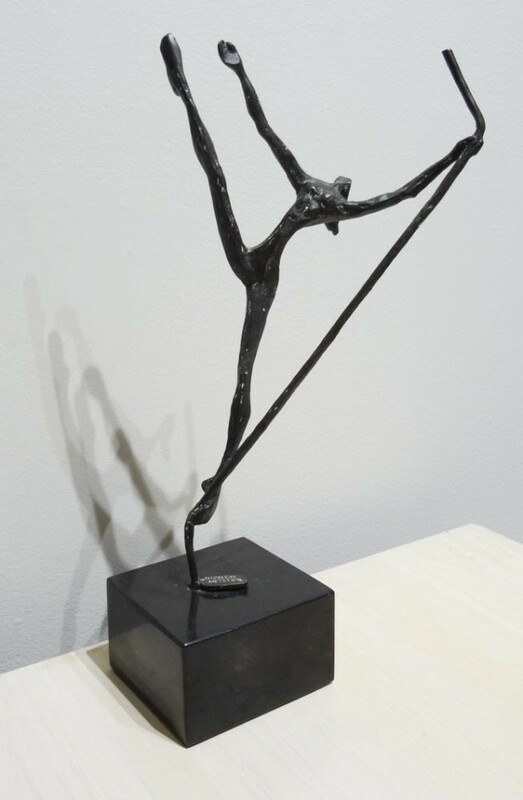 Esther Wertheimer's bronzes have been exhibited widely, with particular recognition in Japan, Canada and the United States.